Do you enjoy Craft Beer from our great state of Michigan? Looking for a FUN night out on the town? Looking for some LIVE music, GREAT food, and a FUN time? 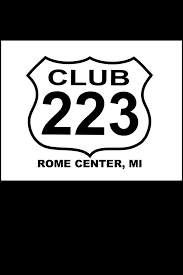 Join Club 223 on Friday, February 1st starting at 5:00. Bell's Brewery from Kalamazoo, MI will be taking over our Tap Handles and will be serving up some of Michigan's finest craft brews. Come join Club 223 for our Pre-Tip Up Weekend and see "What's Tappening". The line up will include: Bell's Two Hearted, Flamingo Fruit Fight, Hopslam, Lager of the Lakes, Amber Ale, Wedding Ale, Porter, and Bear Hug Imperial Stout. You can enjoy them in a flight, a pint, a 23 oz, and by the Growler (ToGo). There will be Bell's and Club SWAG give a ways, raffles, and more. They will be welcoming back FAN FAVORITE - Garrett Collier who will sing the night away as you dance and enjoy good company. Come early to save your table and enjoy our FAMOUS Blue Gill or Alaskan Whitefish for dinner.